Get the tools to coordinate a plan in your community! 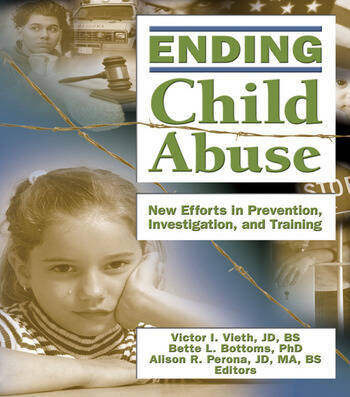 The highly anticipated Ending Child Abuse: New Efforts in Prevention, Investigation, and Training presents an exciting vision: to end or significantly reduce child abuse. Respected social scientists and legal scholars discuss empirically sound short- and long- term multidisciplinary strategies that can be implemented in our society. Innovative and well-established concepts and approaches are clearly presented, such as specialized education, rational preventative methods, effective investigation and prosecution strategies, and the analysis of factors that influence law enforcement investigations and child abuse prevention efforts. Several obstacles stand in the way of the elimination of child abuse, such as the failure to investigate most child abuse reports, inadequate training of frontline child protection professionals, lack of financial resources, and the dilemma that child abuse is not addressed at the youngest ages. Ending Child Abuse: New Efforts in Prevention, Investigation, and Training tackles these problems and others with practical guidelines and aggressive creative strategies that can be applied to every community in the United States. This collection is impeccably referenced and soundly supported with research. Ending Child Abuse: New Efforts in Prevention, Investigation, and Training is an ambitious eye-opening source perfect for social services professionals, mental health professionals, practitioners, researchers, educators, students, and medical and legal professionals who deal with child abuse and children’s welfare.